During the Chem Show in New York City, I was interviewed by Chemical Processing magazine's Senior Digital Editor, Traci Purdum. I thought I would share some of the Q&A's that were covered. If you are at the Chem Show, stop by and see us at booth 303! Why does Brooks Instrument exhibit at the Chem Show? 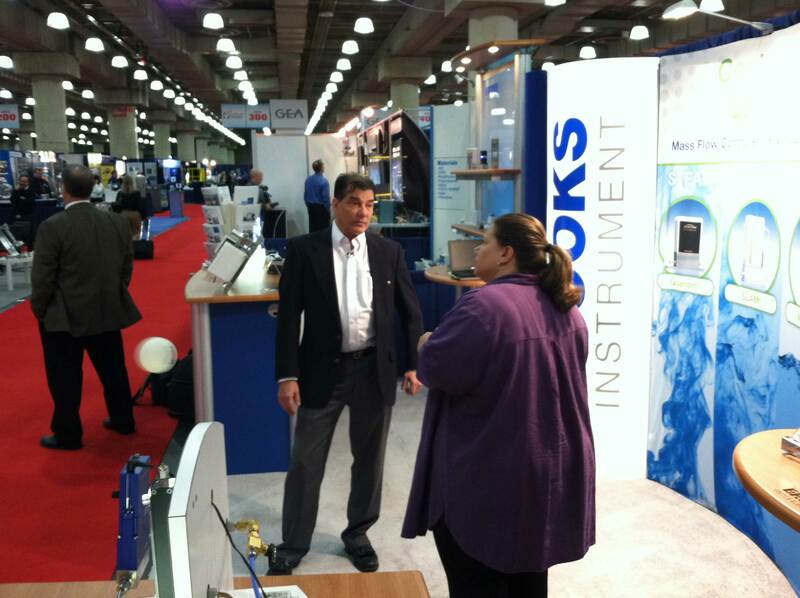 Brooks Instrument has been exhibiting at the Chem show for about 40 years. This is a great show for Brooks because most of our products are well suited for the chemical and petrochemical markets. We have a broad range of flow, pressure and vacuum instruments to satisfy a broad range of applications in these markets. What technology advancements has Brooks Instrument made that might be of interest? We have a growing portfolio of mass flow meters and mass flow controllers that are available with MultFlo™ technology. This MultiFlo capability provides two primary benefits. The first is actual process gas measurement accuracy. Most mass flow devices use a single point conversion factor to approximate the flow of the users process gas relative to a calibration gas. The Brooks MultiFlo technology employs conversion functions that are based on extensive theoretical and empirical modeling. With MultiFlo technology the user gets up to 10 times better accuracy compared to the single point conversion method. The other benefit of the MultiFlo technology is flexibility. Through a simple software interface the user can change the gas or range of any MultiFlo capable device in less than a minute without removing the device from the process. This is great for research applications where the user may need to quickly change process gasses or ranges. This also allows users with a large installed based of mass flow devices to reduce the spares inventory that might be required to maximize process up-time. With more installations moving toward digital communications what does Brooks Instrument offer to support this trend? Brooks introduced the first digital mass flow controller to the market and we continue to be a leader in this area. We offer a wide range of digital communication protocols including RS485, DeviceNet, Profibus, HART, and Foundation Fieldbus. And we are getting ready to introduce an extension to our GF Series mass flow products that will include EtherCAT. Brooks Instrument is known for their variable area flow meter and thermal mass flow meter products. What other products do you offer and what makes them unique? We have expanded our portfolio to include Coriolis mass flow control devices, pressure gauges and pressure transducers. Our SolidSense II pressure transmitters employ digital temperature compensation resulting in superior stability over the entire operating temperature range. The XacTorr heated capacitance diaphragm gauges (or capacitance manometer) for vacuum applications have a patented sensor that provides superior protection from deposition of process gasses and reduced long term drift. These features significantly extend the usable life of the device and also reduce the maintenance intervals. Brooks was the first to introduce an ultra low flow Coriolis mass flow controller to the market. Quantim™ provides accuracy as good as +/- 0.2% of rate and flow rates down to 1 gram per hour. The Coliolis technology is a direct mass measurement so it is completely independent of fluid type and process conditions. We have packaged this measurement device with an integral valve and on board pid control electronics which proves a nice turn key solution for the user. This is used extensively in the Chemical and petrochemical research market. The Quantim Coriolis along with our gas mass flow device combine with our direct liquid injection vaporizer to provide an excellent solution for vapor delivery. The liquid and gas are delivered to an atomizer which breaks the liquid into fine droplets prior to entering the hot gas vaporizer. With this technique the surface area of the liquid is maximized and the liquid is vaporized by the hot gas. The result is superior vapor delivery with no liquid carry over and no thermal decomposition. We have several customers in the chemical market using our direct liquid injection vaporizer system to vaporize MTS (methyl trichloro silane) for delivery bulk silicon carbide. What other features do you offer that might be of interest. The Brooks portfolio is well suited for applications in the chemical and petrochemical industries with high temperature and high pressure capabilities and a range of global certifications and approvals.